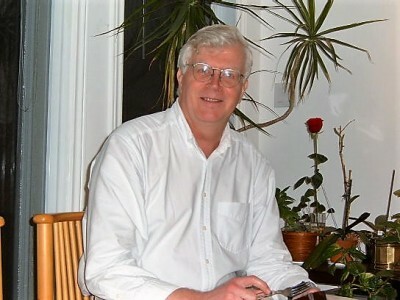 Great picture of my brother, who died in 2012. He would have been 70 today. I would love to talk to him again, and especially would love his take on Trump, populism and such. Easily the smartest person in our family, though he always was humble and said that title — along with “the funniest” — belonged to our mother. This picture is from Christmas 2005. My brother died six years ago today. I never have sufficient — or original — words for this anniversary, so I’ll leave it to John Ford. Alan was a big fan of Ford’s films (as am I), and Ford was fond of one hymn in particular. Enjoy these scenes from Tobacco Road, My Darling Clemetine, Wagon Master, Seven Women, Stagecoach, The Searchers and Three Godfathers. Alan adored The Searchers, in particular. Large families are sometimes romanticized, but I am here to tell you that they are also often highly over-rated. Paul Gosar could tell you the same. I was thinking about this, when I stumbled upon a months-old column about Israel and the Mavi Marmara, in which an anti-Israel “activist” who was aboard the boat admits that the Israelis did not initiate the violence. No kidding. Was there ever any doubt? What is the connection between these two topics? Well, I have a relative who is a bullying anti-Semite (cough, “anti-Zionist”, cough), who spent the better part of the first 18 years of my life putting me through unmitigated hell. Now, when the Mavi Marmara news hit the headlines, I wrote a story in the National Post about it. Aforementioned bullying relative (“BR,” for purposes of expediency) then sent me an email comparing the incident to the Achille Lauro (and comparing the Israelis to the terrorists). He also went on to accuse me of having written (on my previous blog) that I don’t believe in fact-checking. A lie and absurd, of course. I am a journalist and a historian (albeit, an amateur historian) and facts are what interest me the most. BR further asserted that he believed in “rigorous fact-checking.” Another lie. So I wrote back to BR saying, “Put the words ‘fact’ and ‘check’ into the search box on my blog and anything I have written containing those words will come up. I guarantee I have never written that I don’t believe in fact-checking.” So BR writes back saying he is not good at technology and can’t put words in a search box and click. Yet another lie. We went back and forth a couple of more times, with him trying to weasel out of his lies and me finally saying, “Follow your own advice and fact-check.” When I sent that message it bounced back with the message that I had been blocked. Bullies hate it when you get the better of them. I forwarded the message chain to my oldest brother, Alan (far and away the smartest person in our family, and now deceased, sadly), who couldn’t stop laughing at BR’s assertions. Few things, said Alan, were more ridiculous than the notion that BR believed in checking facts in any capacity, least of all rigorously. Alan also gave me this advice: eventually BR will start messaging you again. Before that even begins, block his email address. So I did. It was great advice. I also forwarded the message chain from BR to a non-family member to see if they thought I was making too much of it. Nope, they replied, this person is obsessed with you, and with hurting you, and is clearly deeply jealous of you. This person is nasty. He gave the same advice as Alan – block BR. Today is the fourth of anniversary of my mother’s passing. She loved this hymn, as do I. Fitting for Easter, as well. I love the Alan Jackson version (don’t know if mum did). Dear readers, please continue to check my other website – I will be adding more letters anon. Dear readers, please don’t forget to keep checking my tumblr, where I am posting my uncle’s letters from World War II. There are still more letters to post, as well as photographs, documents and some of his poetry. 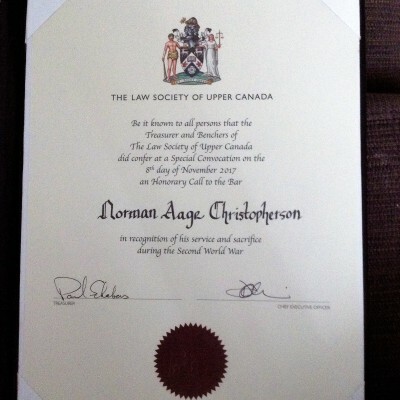 Earlier this week, my late uncle was given an Honorary Call to the Bar by the Law Society of Upper Canada. It was a beautiful ceremony and, in particular, I would like to thank Patrick Shea for being the driving force behind the event. Five years ago my brother died. 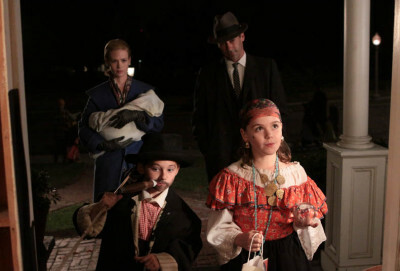 I wrote a bit about it last year here, and given that it is Hallowe’en, I want to pay tribute to Alan by mentioning an episode of Mad Men that touched both of our hearts so much, The Gypsy and the Hobo. Here is a wonderful still from the episode – I still remember talking with him about the episode for like, three hours over the phone!